FREDERICK, MD-Frederick Keys fans will be the biggest winners when the club plays its season finale on Monday, September 3 at 2:00 p.m against the Myrtle Beach Pelicans. Gates open at 1 and everyone fan who comes through the gates receives a raffle ticket to win great prizes throughout the afternoon. These include autographed hats, jerseys, balls and photos to go with jerseys, shirseys, hats and much more. This year's top prizes include a Chris Davis signed jersey and a Chance Sisco signed bat. 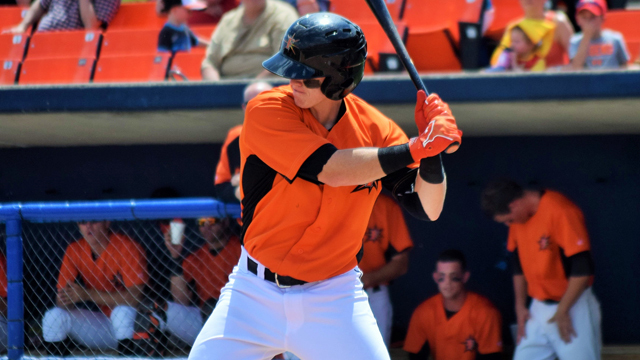 A member of the 2015 Keys, Sisco made his Orioles debut in 2017, while Davis played for Frederick on a Major League rehab assignment last year. Other feature items include autographed baseballs by Manny Machado , Dylan Bundy, Matt Wieters and Eduardo Rodriguez , and a Zach Britton signed photo. Fans can also win a J.J. Hardy autographed hat, a Kevin Gausman signed photo, an Orioles Hawaiian Shirt, a Buck "Snowwalter" Snow Globe, tickets to Medieval times and more. Monday's game is also a Kids Eat Free Monday presented by Buffalo Wild Wings and Key 103 as well as a Make a Difference Monday sponsored by BGE Home. For tickets, fans can call the Keys at 301-815-9939 or visit frederickkeys.com. For more information about the Keys final homestand fans can call the team at 301-815-9900 or visit frederickkeys.com.